Great place to stay with kids and we would recommend to our friends! Family friendly - great water park for kids. wonderful breakfast. Loved the view, distance to our meeting, friendliness of staff! Nice hotel in Erie, PA. Nice complimentary breakfast. Located on the shores of Lake Erie, this city holds a special place in the state because it is the only port on the Great Lakes. In fact, much of life and tourism in Erie revolves around the sparkling waters of the lake. Erie mixes a Midwestern small-town feel, the personality of a distinctive, thriving city, and long-established accommodations across its neighborhoods. Erie is the perfect stop on a family vacation. Beaches call to the young and the young at heart; Liberty Park and Lampe Campground are located directly on the lake. The Erie Zoo offers full-fledged adventure with a train ride through the zoo and large botanical gardens. Waldameer Water World is another family favorite found at the base of Presque Isle. From kiddie rides to soaring roller coasters, Waldameer offers laughs for everyone as well as a great way to cool off on hot, mid-summer days. Erie offers accessible history through its beautifully maintained museums. For a nominal admission price, the Erie Art Museum boasts a collection of over 5,000 pieces and also hosts traveling collections throughout the year. The Erie Maritime Museum is located on the waterfront and houses the U.S. Brig Niagara, a flagship from the War of 1812. Children will love the expERIEnce Children's Museum, which houses many hands-on, educational exhibits. Although Erie may not be the largest city in Pennsylvania, it still has a wide variety of arts options, including the Erie Philharmonic, which offers a pop and symphonic series, as well as the Erie Playhouse, offering several dramas, comedies and musicals throughout the year. Several minor league teams draw sports enthusiasts to Erie during any month of the year. The Erie Seawolves play baseball at Jerry Uht Park during the summer while the Erie Insurance Arena hosts the BayHawks basketball and Otters hockey teams. Summer is the best time to visit as Erie comes alive with festivals, beach activities and family-friendly amusements on the lakeside. Average highs in mid-summer are around 80 degrees with cooling breezes. In winter, Lake Erie may freeze over by January, leaving the skies crystal clear and the well-maintained roads free from ice and snow. The Erie International Airport (ERI) is the nearest airport with only a 12-minute drive to the city center; major airlines, including United, Delta and US Airways, offer daily service. Those who prefer train travel can pull directly into Union Station in downtown Erie. However, most trains arrive and depart sometime after midnight. For even more budget-friendly travel, visitors can use the Greyhound Bus Station with connections to Buffalo, New York and Cleveland. Drivers have easy access to all of Erie. The Glass House Inn offers comfortable, tastefully decorated rooms near Presque Isle State Park. 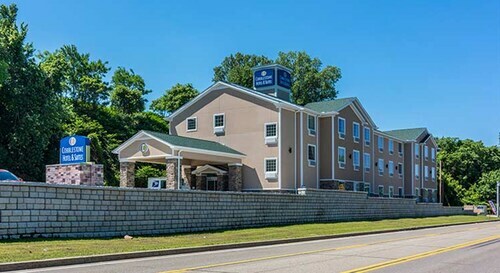 The Fairfield Inn by Marriot, conveniently located off the interstate, is a popular choice for business travelers. Accommodations close to the waterfront include the Sheraton Erie Bayfront Hotel with gorgeous lake views, and Homewood Suites for longer stays. Erie offers warm summers with moderate humidity and cold winters with lots of snow. Spring features some very warm days mixed in with unexpected snow or ice storms. Autumn sees crisp days with prolonged sunshine. Winter squalls occasionally blow in from Canada, picking up a great deal of moisture over the lake. Good value for the cost. Friendly staff made suggestions where to eat. Nice sized rooms and generally clean. Staff was nice during check in but when i called down to ask about a 30 to 60 min late check out the night auditor was very unhelpful say it would have a extra charge and he couldn't help anyway because he was "auditing". This was my 5th stay here and i know there is no cost especially when the hotel is mostly empty. The "hot tub" in the room was great, the controls were fixed from last year and we didnt need to use a wrench. The fridge barely got cold regardless of the setting we put it on. The exhaust fan in the bathroom dripped a brown liquid when showering, guessing dust and dirt has built up in there and needs cleaned out. Luckily dripped onto the back of the toilet and easy to avoid. The worst part is the mattress was completely past its life. We both have sore backs after two nights on it and could feel the springs. This place needs some work but we would stay again, hoping these issues will be addressed.